Don’t forget: Optimize those URLs! When you’re planning on launching a website, a great deal of work and thought goes into the site content, UX/UI design, architecture and analytics tracking. Sometimes it is easy to focus all a team’s energy on the flashier components – and forget to sweat the small stuff. Yeah, let me take 15 minutes of my precious time to type that keyboard mash URL into my address bar. 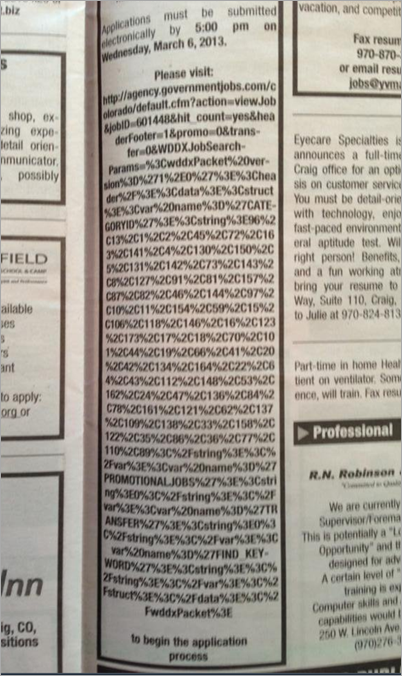 I’m sorry, crappy newspaper ad, but I and thousands of other people will never begin that application process. It will take some extra time, but irritating your potential user can be prevented. It will be much easier to front-load this work in your team’s process to encourage your viewers to come back or, hell, even visit the first time. Don’t know where to start? Here are some important things to acknowledge when picking your desired URL. You must consider the UX of URLs and domain names. This is important not only for the obvious SEO benefits, but also for catering to the experience of the user who will be typing this URL out in their address bar, especially on mobile devices. If the URL is extremely long, there’s not a chance you’ll see me typing that into my phone on-the-go. A usable site requires a domain name that is short, easy to remember, easy to spell, and easy to type. The more readable, the better. You get much more word-of-mouth exposure if it’s a name you can easily say without having to spell it out. A properly structured website will carry a range of benefits. It is crucial to understand that your website’s content must be part of a comprehensible, meaningful site architecture that allows you to scale over time. wwww.randomstore.com/pets/dogs/accessories does a good job of helping users visualize the site structure. They will instantly know what the main category and subcategory pages are. As www.randomstore.com/dogs_accessories/pets, will only confuse savvy users and leave them not feeling confident while browsing. Another example, Reddit does a good job of getting users to understand their subreddit link structure: www.reddit.com/r/animalsbeingjerks. To view a subreddit, the name of the subreddit needs to be accompanied with /r/. As a user, it’s muscle memory for me to type out wwww.reddit.com/r/ because visually, I understand that subreddits are not a part of the main navigation. Clean, easy-to-understand URLs help users clarify where they are and where they want to go. Search engines like Google and Bing are getting more advanced and closer to understanding natural languages and thought processes, so they should be considered a user too. From a SEO perspective, canonical URLS are very important. Does your site have multiple URLs serving the same content on the page? It will be in your site’s best interest for you to canonicalize them. For example, your homepage could be serving up to 8 variations of URLs. Each of these examples are competing for ranking, serving the exact same content. Pick one URL that you ultimately want users to see and make sure that all variations of your website redirect to the correct URL. When you have one domain and URL structure, there is a better chance that your site will rank higher. Optimized URLs are for both search engines and users. If you think strategically about your URL structure, your website will be both more trustworthy to users and likely to rank higher in search engine results pages. Instead of getting verbally abused, you can successfully get that cool dude to view your beer comparison website and tell all his bros about it.